If you are interested in birdwatching, wildlife viewing, or stargazing; flowers, geology, or water; nature centers, festivals, or photography, a destination in Texas awaits you. From the desert gardens of Big Bend to hawk watching on the Gulf Coast to caving and bat watching in the Hill Country, nature-oriented travel in Texas also includes lesser known getaways. 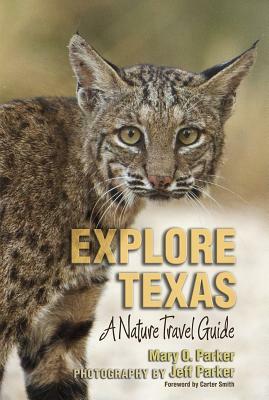 Organized by the seven official state travel regions, Explore Texas features descriptions of almost one hundred nature-oriented sites, including information about the best time to visit and why it’s worth going; location, and other logistics; and a “learn” section on the observations and natural phenomena a visitor might expect to experience. Photographs by professional photographer Jeff Parker accompany the accounts, and handy color-coded icons help guide readers to the activities of their choice. Perfect for planning the family’s next outing or vacation, this book also contains a message of how nature tourism helps to protect biodiversity, promote conservation, and sustain the state’s tourism economy. MARY O. PARKER is a freelance writer and owner of Red Belly Writing School. Her work regularly appears in Texas Parks and Wildlife magazine. She lives in Central Texas. JEFF PARKER is an award-winning wildlife and nature photographer whose work has appeared in Audubon, Texas Parks and Wildlife, and American Profile. He leads photo tours and workshops in South Texas and throughout the Americas.